The Property Committee plans for and maintains the safety, security, comfort and attractiveness of the buildings and grounds of the Meeting. It works closely with Meeting staff and the other Committees, and with Trustees when spending of bequests, endowments as permitted, and the Building Campaign Fund is involved. It understands how the capabilities and limitations of the property affect its appropriate use. It helps the Meeting maintain a respectful relationship with its neighbors. The Committee is responsible for the condition of building structures, exteriors, systems, furnishing, equipment, and major appliances, excepting office equipment, which is solely the responsibility of staff. It is responsible for the acquisition, maintenance and disposal of Meeting’s furnishings and equipment, and for internal repairs, maintenance, and housekeeping, coordinating volunteers for assistance as appropriate. 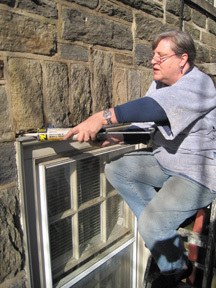 The Committee arranges for and may participate in regular maintenance inspections of the property. It anticipates future needs and prioritizes projects while addressing the issues that arise more suddenly. It maintains a mid-to-long term plan for the maintenance of the Meeting’s property and informs the Finance and Stewardship Committee of the likely pattern of needed spending. The Committee approves repairs and replacements with the goal of finding longer term, lower maintenance solutions, and solutions that are as economical and environmentally sound as is practical. The Committee consults with the Hospitality Committee in regard to furnishings and equipment related to the hospitality function, and with other Committees in regard to their equipment needs. It employs consultants and contractors as necessary and as approved in the Meeting’s budget process; it provides oversight of such consultants and contractors in coordination with the Administrative Secretary and the Bookkeeper. It delegates day-to-day maintenance and repair to staff, and consults and coordinates with staff on any projects. The Committee works with staff to maintain a body of well-organized information on property maintenance history and practices, and legal and insurance-related rules and recommendations. It also assists staff in maintaining an inventory of furnishings and equipment that is updated biannually. The Committee is responsible for leases or other occupancy agreements with all long-term tenants. It assists in finding, and continuing evaluation of, tenants, considering their conformity with the Meeting approved guidelines for property use. It sets the tasks to be done by the apartment tenant, when this work agreement is part of the conditions of tenancy. It confers with the Finance and Stewardship Committee each year regarding the fees charged tenants for space usage, determining square footage rates for the use of space that would be appropriate in terms of market conditions. The Finance and Stewardship Committee then determines the final usage rates, including any subsidy appropriate for specific tenants in view of the Meeting’s policies for financial support of organizations through the rental process. The Property Committee also confers with the Finance and Stewardship Committee regarding the usage fees for use of space for non-Meeting activities. A member of the Finance and Stewardship Committee and the Administrative Secretary are ex officio members of this Committee. List of Property Committee members. The Property Committee is committed to providing timely response to maintenance requests. For requests of an emergency or urgent nature, please call the Meeting at (202) 483-3310, or use the Contact Form and select Property issues as the message category. What Does It Cost to Maintain Our Property? One year doesn't tell the whole story, of course, but the attached budget spreadsheets will give you some sense of our planned spending for property expenses and improvements in FY 2011. The operating budget tells about utilities, routine maintenance, and other somewhat routine costs. The reserve authorization is for items that are paid for out of a reserve that is set aside for larger expenditures, such as a new heating system, new roof, or other major repairs or improvements. The Property. 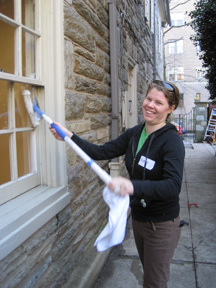 Committee is currently involved in organizing Work Days at FMW to provide much overdue sprucing up of the campus. It's also a great way to become involved in the FMW community. The committee would like to thank everyone who has participated in the Work Days so far this year. Please check Upcoming Events for future Work Days. The Property Committee is committed to increasing the energy efficiency and reducing the carbon footprint of the meeting, to the extent that it is economically feasible. Often, these goals are completely consistent, as the recent installation of programmable thermostats within the meetinghouse has already resulted in decreased utility bills and have paid for themselves. In 2017, FMW installed a 25-kilowatt solar panel array on the westward facing roof of the Meetinghouse. For more information, see our solar panel array page. In 1985, an acoustical consultant called Polysonics was commissioned to analyze the acoustics of the Meeting Room and make recommendations on how to improve them. Although it is a rather old report, the Meeting Room hasn't changed that much and so this surprisingly well written report has something to say to our current discussion of how to improve the experience of the hearing impaired. The entire report can be found at Polysonics Acoustical Consultant's Report. An executive summary follows. There are two problems with the acoustics in the Meeting Room: 1) a high amount of background or ambient noise (from exterior traffic and the HVAC system) relative to the volume of a voice providing vocal ministry and 2) a relatively long reverberation or echo time of 1.3 seconds. Reverberation has a positive and negative effect on acoustics. The positive effect is that it can allow reflected sound to carry further. The negative is that it can blur the speech, especially of an untrained speaker. The report includes considerable discussion about how to achieve improvements in hearing by installing an audio system. The benefits of such a system are described as only moderately effective and only after first reducing reverberation time and exterior background or ambient noise. The challenge on such a system is described as being on the microphone side and recommends two microphones at ceiling level, not the three microphones hanging down considerably from the ceiling that we currently have. Assuming a quality system is purchased and properly installed the actual performance of any of the above will be limited by the microphone system and room acoustics and not by the particular electronic transmitting/receiving earphone system. I believe our experience with the system that was eventually installed has borne out this statement. We need your help! Property Committee events are listed on the Upcoming Events, and everyone is welcome to any of our events. We are always recruiting new members for the committee. To express interest, contact Brian Lutenegger or Merry Pearlstein. You can also express interest by using the Contact Form and selecting "Property issues" as the message category.